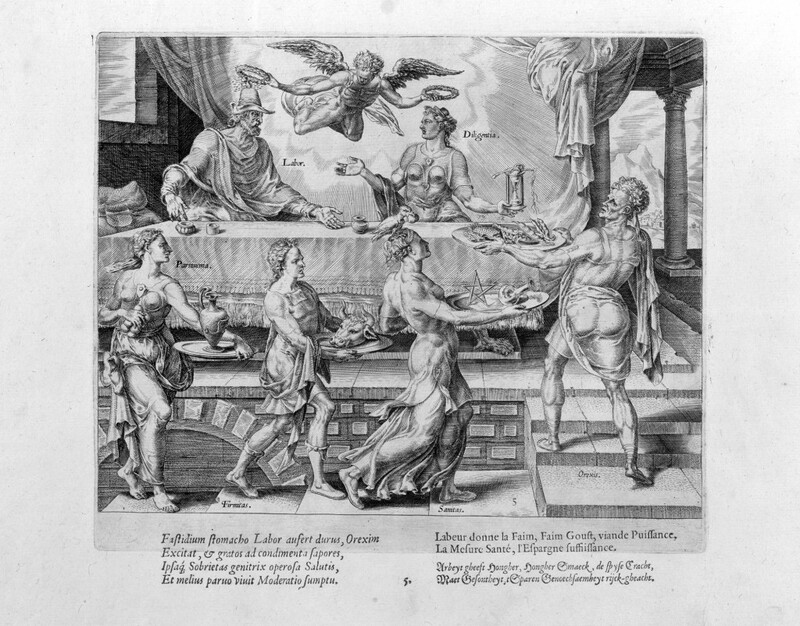 Labor and Diligence Enjoying Their Simple Meal is a print from the series The Reward of Labor and Diligence, engravings created by the Dutch artist Maerten van Heemskerck in 1572. The standard of prints in mid-sixteenth century Holland was to create an art form whose purpose was not only to be aesthetically pleasing, but also to have an edifying, practical message that was easy to understand. The message would be revealed through the accompanying verses, which would serve to explain or clarify the visual image. The engraving depicts “Labor” as a common man, and “Diligence” as a woman, seated at a long table, arms open and bodies facing one-another. Labor, as depicted in the painting, is defined as physical work done for the purpose of economic gain, and diligence, as personified in the painting, is defined as the constant and steadfast effort to accomplish the expected and undertaken tasks. There is no specific evidence as to why the artist might have chosen to represent labor and diligence as a man and a woman, respectively, but we can infer from the gender roles in ancient Greek culture that this portrayal would be appropriate. Women in ancient Greece were “regarded as a lower order of beings, neglected by nature in comparison with man, both in point of intellect and heart…and fitted only for propagating the species”(Katz 77). The place of women was within the home, their primary purpose to be dutiful mothers and loyal and obedient wives. This was similar to the expected behavior of women in the time period of Van Heemskerk, when indolent and negligent women were frowned upon. Hardworking women took care of the household tasks and were not lazy; thus, the ideal women were diligent in their work. Meanwhile, the men of ancient Greece held the positions of power and prestige. The men of ancient Greece were educated beginning at age seven, and engaged in work outside of the household, such as working the fields, sailing, hunting, engaging in trade, or training to be athletes. Because of men’s expectation to provide for the family, and engage in physical work, labor is personified in a masculine form. Above Labor and Diligence is an angel, prepared to crown them, commemorating each and indicating that all human beings should aspire to be hard-working and diligent laborers in order to be accepted into the Kingdom of God. This was connected to the 16th century ideals of valuing work ethic and frugality. No food can be seen upon the table besides a small teacup that sits in front of Labor; instead, four individuals majestically enter the scene at the bottom of the engraving, prepared to bring large platters to the empty table of Labor and Diligence. This first figure carries a plate of light food, what appears to be some long pods of peas and some slices of meat. The next figure carries a star; the third individual brings forth a bull’s head, and the last brings a pottery vase. The majority of the items that will be presented for the meal are inedible; instead, they are symbolic. The main purpose of the meal is sustenance as opposed to decadence and abundance that would usually be associated with a feast. However, the modest amount of food and the emphasis upon the gifts of the virtues are portrayed as honored rewards, elevating the abstinence from the indulgence of the palate to a higher, more godly and honorary status. The star carried is the symbol of health and the representation of the Greek goddess of health, Hygieia (“Pentagram” 1). The bull’s head is a symbol of firmness, support, endurance and strength, and “has appeared in several images and art produced by the Mesopotamian cultures and the Mediterranean basin, from the Sumerians to the Iberian and Roman pre-Christian cultures,” (Koroxenidis 1). The final object is a ceramic vase, a contemporary and very common object of usage in the time-period of the Greeks. Due to the abundance of clay in Greece, the production of vases was not expensive, and the value of the ceramics low. The vase in the print represents thrift because of its simplicity and routine usage. In the sixth print entitled Labor and Diligence Enjoying Their Simple Meal, it is shown that once the daily work is completed, Labor and his wife Diligence sit to enjoy a “modest but nutritious meal, waited upon by the personifications of Appetite, Health, Firmness, and Thrift” (Veldman 139). The Latin verses at the bottom of the engraving translate to reveal the main message: by eating moderately, we remain healthy and thrifty. The artist’s main goal is to express this moral of the story without a hidden symbolism, but with “topical metaphors or well-known subjects taken from the bible and classical mythology, given a definite function in addition to their narrative aspect” (Veldman 141). Labor and Diligence Enjoying Their Simple Meal elevates the position of the common man and the importance of adhering to the virtues (primarily of labor and diligence), throughout a modest life. Eating is approached in a practical way; the focus is on its purpose for nourishment of the body to promote “health and firmness.” This simplicity can be equated to the consumption of simple, whole-some food as the “material for growth, self-maintenance, and self-healing” (Kass 30) that is essential to the soul, which differs from our modern day culture that has seen an emergence of eating as considered a “pleasurable intermediate activity, inserted between need and necessity” (Kass 59) that has been embodied through feasting and the characterization of eating as a recreational activity. Labor and Diligence Enjoying Their Simple Meal rejects overindulgence —even the food delivered by “Appetite” is not too plentiful. Thus, it can be concluded that the sumptuous element of the feast is eliminated, and the more sustainable and everyday meal is elevated in terms of spiritual worth. At the same time this parallels the physically elevated trestle table. It can be interpreted as an emblem of royal reward and it’s connection to the Mycenaean society in regards to the practices of drinking and feasting in order to “imply the importance of the formation of an elite culture” (Wright 133). The depiction of feasting scenes upon frescos of Crete and Mycenaean pottery are expressions of “hierarchical, sociopolitical structures and the formation of an elite identity” (Wright 133). The trestle table appears to be prepared for a banquet, yet in the work’s depiction of the virtues and their abstinence from excessiveness in food and drink, the message translates to the royal reward that is received with adherence to simplicity with a commitment to labor and diligence in everyday life. Veldman, Ilja M. “Simiolus.” Netherlands Quarterly for the History of Art 20.2 (1990): 124-41. JSTOR. Web. 10 Oct. 2010. Wright, James C. “A Survey of Evidence for Feasting in Mycenaean Society.” Hesperia 73.2 (2004): 133-140. JSTOR. Web. 26 Oct. 2010. Katz, Marilyn. “Ideology and ‘The Status of Women’ in Ancient Greece.” History and Feminist Theory 31.3 (1992): 70-97. JSTOR. Web. 26 Oct. 2010. Koroxenidi, Alexandra. “The Bull in the Ancient World.” Ekathimerini.com. Kathimerini, 2003.Web. 10 Oct. 2010. “The Pentagram.” Freemasonry.bcy.cy. Grand Lodge of British Columbia and Yukon, 2007. Web. 10 Oct. 2010.Kass, Leon R.
Kass, Leon R. Food and Nourishing. Chicago: University of Chicago Press, 1999. Print.